The ESONET NoE is a stepping stone on the way to create an underwater ocean observatory network that will remain in place for decades. The costs and practicalities of sustaining such a network require a concerted approach by the funding agencies of the European countries over a long time period. Any single country or the EU alone can not afford the costs of this kind of long-term network; the expertise required to create and manage the observatories lies in more than one country; and the ship time to service and install the equipment requires a combined effort. But the benefits will also be shared by all the maritime nations of Europe. To estimate the cost of the infrastructure and its sustainability, the ESONIM project was in the process of establishing technical, legal and financial models for deep sea observatories. ESONET will pursue this effort by running the ESONIM model on marine areas selected. Funding agencies will be informed of the work in progress, future benefits and opportunities. The foreseen structure of governance of the European Seas Observatory Network that the NoE will build is not easy to determine. One of the objectives of ESONET NoE is to investigate the legal, economical and research policy feasibility of the organisation and, in the same time, to build up the convincing elements for its successful achievement. ESONET partners are conscious of the time needed for planning financial commitments that will last beyond the life of the NoE. The associated project EMSO-PP will implement the legal structures. 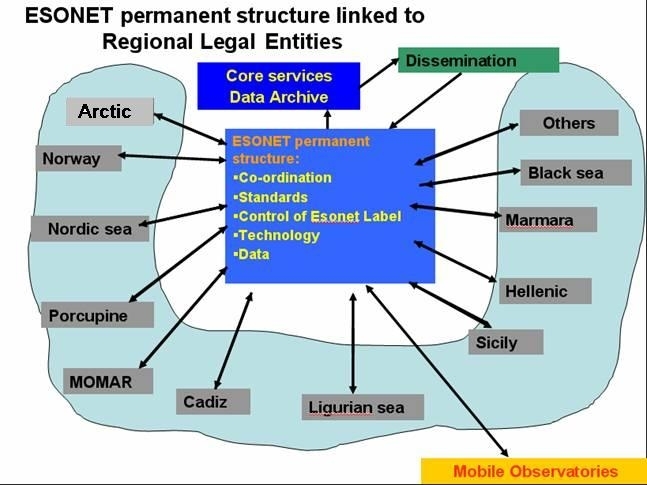 a number of ESONET REGIONAL LEGAL ENTITY (RLE), owners and managers of the infrastructure and activities on one or more ESONET sites. At a first step, ESONET will prepare the implementation of the ESONET community in a virtual institute VISO (Virtual Institute of Subsea Observatories).